A female jazz singer becomes the prime suspect in a series of murders when some of her fellow band members and her mob boss boyfriend all end up dead. It's up to Mike Hammer to find her and keep her safe. This feature derived from the reboot of Mike Hammer, Private Eye aired on TV in two parts in 1998 and was given a feature DVD release in 2003. We don't have any reviews for Mike Hammer: Song Bird. 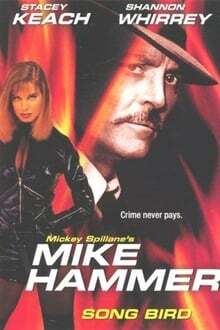 We don't have enough data to suggest any movies based on Mike Hammer: Song Bird. You can help by rating movies you've seen.